BACKGROUND AND PURPOSE: Endovascular brain cooling as a method for rapid and selective induction of hypothermic neuroprotection has not been systematically studied in humans. In this clinical pilot study we investigated the feasibility, safety, and physiologic responses of short-term brain cooling with IC-CSI. MATERIALS AND METHODS: We studied 18 patients (50 ± 10 years old, 9 women) undergoing follow-up cerebral angiography after previous treatment of vascular malformations. Isotonic saline (4–17°C) was infused into 1 internal carotid artery at 33 mL/min for 10 minutes. Brain (JVB) and bladder/esophageal temperature measurements (n = 9) were performed. Both MCAs were monitored with transcranial Doppler sonography (n = 13). Arterial and JV blood were sampled to estimate hemodilution and brain oxygen extraction. RESULTS: JVB temperature dropped ∼0.84 ± 0.13°C and systemic temperature by 0.15 ± 0.08°C from baseline (JVB versus systemic temperature: P = .0006). Systolic MCA-flow velocities decreased from 101 ± 27 to 73 ± 18 cm/s on the infused side and from 83 ± 24 to 78 ± 21 cm/s on the contralateral side (relative changes, −26 ± 8% versus −4 ± 27%; P = .009). Changes in hematocrit (−1.2 ± 1.1%) and cerebral arteriovenous oxygen difference (0.2 ± 1.0 mL O2/100 mL) were not significant. Doppler data showed no signs of vascular spasm or microemboli. No focal neurologic deficits occurred. Pain was not reported. CONCLUSIONS: The results of this pilot study suggest that brain cooling can be achieved safely, rapidly, and selectively by means of IC-CSI, opening a new potential avenue for acute neuroprotection. Clinical investigations with control of infusion parameters and measurements of CBF, oxygen consumption, and brain temperature are warranted. A significant subset of patients with acute ischemic stroke is eligible for local recanalization therapy, such as intra-arterial thrombolysis or mechanical clot extraction.12–16 This subset of patients is at high risk for brain injury due to their larger strokes and the potential for reperfusion injury after successful recanalization.17 Local endovascular cooling with intracarotid infusion of cold saline therefore presents a unique opportunity to provide short-term neuroprotection in such patients by rapidly and selectively cooling brain tissue at ischemic risk before, during, and after endovascular procedures. Several animal experiments (on-line Table)18–24 and theoretic models25–27 support the safety and feasibility of local endovascular brain cooling; however, experience in humans is limited,28,29 and it is yet undetermined whether selective brain cooling is feasible and safe in humans by using this endovascular method. The goals of this translational project were 1) to assess the feasibility and safety of rapid and selective endovascular brain cooling in patients undergoing cerebral angiographic procedures, and 2) to investigate the physiologic responses induced by the local cooling. Procedures were performed with materials routinely used in the interventional angiography suite. This report includes combined results from a 2-part prospective, nonrandomized clinical pilot study and a phantom model experiment. Because the safety of local endovascular infusion of cold saline on the human brain has not been established, a stepwise decrease in saline infusion temperature (starting with temperatures slightly lower than room temperature) was performed. Infusion rate and duration were the same in all patients. Due to the small volume of cold saline, infusion volumes were not adjusted for body weight. For part 1, patients were recruited between June 2006 and February 2007. The main goal, in addition to safety assessment, was to assess intracranial flow changes during local infusion of cold saline. Part 2, a modification of part 1, started in May 2007 and ended in January 2009. In this part, saline infusion temperature was lowered further after analysis of safety data from part 1. The main additional objective in this part was to measure the actual temperature achieved in the brain versus the body. The experimental protocols were approved by the institutional review board at Columbia University Medical Center where the study was performed. Subjects recruited for this pilot study were elective patients with partially or completely treated intracranial vascular diseases undergoing diagnostic cerebral angiograms, who were between 21 and 80 years of age, not disabled at baseline (Rankin Scale score <2), and were able to give written consent. Exclusion criteria included significant stenosis or occlusion of the ICA, intracranial stenosis of brain-supplying vessels, major health problems such as disabling stroke at baseline, tumor or carcinoma, cardiac or renal failure, or pulmonary dysfunction. Patients with known coagulopathy, a platelet count of <75,000, a hematocrit of <30%, an imbalance of electrolytes (enough to require clinical attention), or hypersensitivity to hypothermia (eg, cryoglobulinemia, Raynaud syndrome) were also excluded. Following the diagnostic cerebral angiogram, patients remained in the supine position. The catheter (5F Angiographic Catheter, Cordis, Miami Lakes, Florida) was attached to a standard heparinized room temperature saline drip. The catheter tip remained in the extracranial part of the ICA. A 2-MHz pulse-wave TCD device (Pioneer 4040, Nicolet Vascular, Madison, Wisconsin; Marc 600, Spencer Technologies, Seattle, Washington; at 54–56 mm depths, sampling rate 100 Hz) was used for continuous bilateral MCA FV monitoring (part 1; n = 6 patients). TCD was used in both parts for on-line detection of potential microemboli and vascular spasm (n = 13 patients).30,31 MES were defined as unidirectional (direction of flow) signals, of 10–100 ms duration, and visualized inside the normal Doppler spectrum. A significant sign for vascular spasm was a MCA FV of >160 cm/s. As surrogate measures of brain and body (systemic) temperatures, JVB (pentalumen thermodilution catheter in the “dominant” JV) and bladder or esophageal temperatures were monitored for patients enrolled in part 2. The dominant draining JV was visually assessed from the venous washout phases of the initial angiograms. If both JVs showed equal drainage patterns, the ipsilateral JV was selected for the placement of the JVB catheter. From a femoral vein access the thermodilution catheter was navigated to the JVB (superior bulb of the internal jugular vein) under fluoroscopic guidance to ensure its correct placement in the JVB and avoid mixing from facial blood. Systemic temperature was assessed with either a Foley catheter or an esophageal catheter with integrated temperature probe. All temperatures were continuously monitored (displayed on patient's monitor) and recorded on a central server during the procedure. Warming blankets (Bair Hugger) were used in the last 12 patients to avoid shivering and potential systemic cooling. Isotonic saline bags (1000 mL, 0.9%) were degassed and cooled to ∼15°C (range, 12–17°C) for part 1 and to ∼7°C (range, 4–10°C) for part 2. 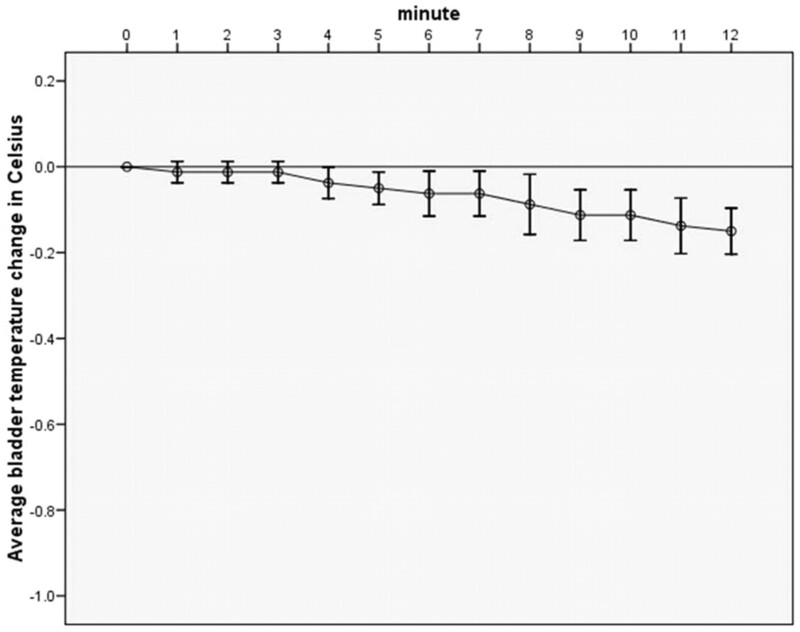 After baseline TCD recording for ∼1 minute, the heparinized cold saline was infused into the ICA by using 2 continuous infusion pumps (Colleague, Baxter Healthcare, Irvine, California) at the maximum flow rate of 33 mL/min (2 × 1000 mL/h). Infusion lines were attached to 2 small-bore air filters (PFE-1207, B. Braun Medical, Bethlehem, Pennsylvania). Study duration ranged from 10 to 13 minutes. Vital signs (blood pressure, heart rate, capillary oxygen saturation) were recorded every minute from the patient's monitor. Consciousness and verbal response were assessed during the study in awake patients. Neurologic examination was performed by a study neurologist before and after the study in all patients. In part 2 local brain and systemic temperatures measurements were taken every minute throughout the procedure; blood samples (blood gases, hematocrit, blood count, and electrolytes) were obtained from an arterial access and the JVB before and at the end of the cold infusion; Doppler spectra and angiographic images were studied for signs of vascular spasm or microemboli. where CaO2 is the arterial oxygen content (CvO2 for venous), Hgb is hemoglobin, SaO2 is the arterial oxygen saturation (SvO2 for venous), and PaO2 is the arterial partial pressure of oxygen (PvO2 for venous). The difference between CaO2 and CvO2 is AvO2 (arteriovenous difference in oxygen content) and was used as a surrogate measure of oxygen extraction. Nonparametric tests were used for comparison of averaged values from variables and percentage values. All statistical analyses were performed by using SPSS (Chicago, Illinois), version 11.5.
where Tcp is the temperature of the cold perfusate and T0 is the outflow temperature. ICA blood flow was assumed to be 250 mL/min. The initial femoral inflow temperature was 5.4 ± 0.41°C and the fluid in the phantom was 38 ± 0.76°C. 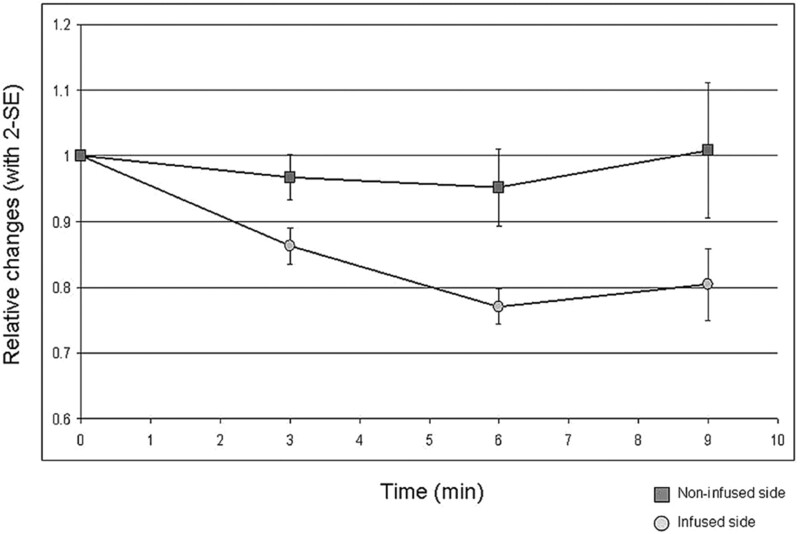 The initial mean outflow temperature at the catheter tip was 25.21 ± 0.49°C. 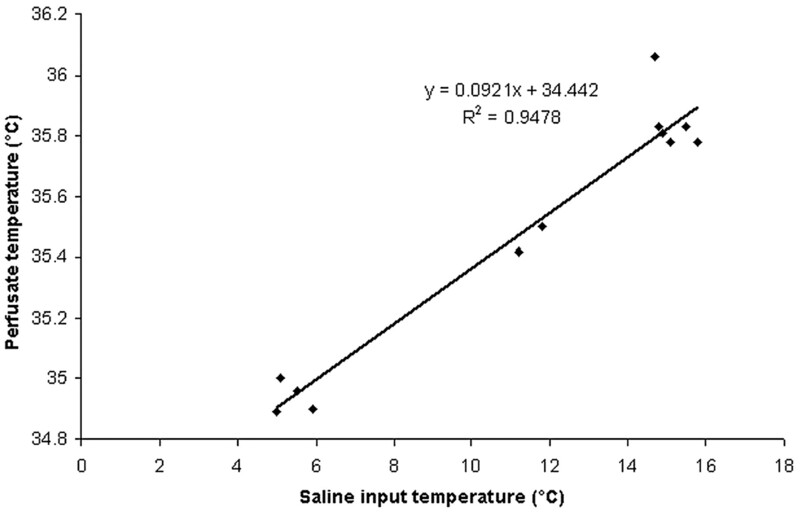 The calculated temperatures of the perfusate relative to the saline infusion temperature are presented in Fig 1 (r2 = 0.95). Phantom model experiment: temperature of the saline-ICA “blood” mixture. The study was performed in 18 patients (9 women, mean age, 50 ± 10 years; Table 1). Nine patients were enrolled into part 1 of the study. Two patients had poor temporal window for TCD insonation and 1 had incomplete TCD data. Thus, TCD data were analyzed from 6 patients (Table 1). However, clinical data (assessment of neurologic deficits, consciousness, verbal response, and pain during procedure) were available from all patients. Although baseline MCA FVs were higher on the infusion side, they decreased to below the values of the noninfused side during the infusion of cold saline (Table 2). FVs decreased on the noninfused side as well, but the relative decrease in systolic FVs was significantly greater on the infusion side compared with the noninfusion side (P = .009; Fig 2). The changes in diastolic FVs were not significant (P = .065). PIs increased on both sides (21% versus 14%), but the difference was not significant. The average cold saline temperature was 15.6 ± 1.7°C. The average room temperature was 22 ± 2.1°C. Capillary oxygen saturation as measured by pulse oxymetry remained >95% during the procedure. Systolic MCA blood flow velocity on the side of the infusion and the noninfused side. Relative changes (2 SEs). Nine patients were enrolled into the second part of the study. The mean JVB temperature (baseline, 35.7 ± 0.7°C) dropped by 0.84 ± 0.13°C in a mean time of 8.2 ± 1.9 minutes (Fig 3) and the bladder temperature (baseline, 35.6 ± 0.7°C) dropped by 0.15 ± 0.08°C (Fig 4). The JVB temperature decrease was significantly greater when compared with the decrease in bladder temperature (P = .0006). The changes in systemic hematocrit and arteriovenous oxygen difference were not significant (Table 2). Other laboratory values (blood count, coagulation, electrolytes, epinephrine, and norepinephrine) and vitals remained in the normal range. The average cold saline temperature was 7.4 ± 2.4°C. Urinary output during study procedure was measured in the last 3 patients (mean output, 317 ± 120 mL). Jugular venous bulb temperature changes (°C; SD) during endovascular cold saline infusion into the ICA. Bladder/esophageal temperature changes (°C; SD) during endovascular cold saline infusion into the ICA. Vital signs did not change significantly during the study procedure. Consciousness and verbal response in the 11 conscious patients remained unaltered during the study procedure. In 3 awake patients either partial (face) or systemic shivering was observed shortly after the start of the cold infusion. However, this shivering stopped after a few minutes and remained unnoticed by 1 of the 3 patients. No pain or discomfort was reported. Neurologic examination revealed no focal deficits in any of the 18 patients. Neither Doppler spectra nor angiographic control revealed signs of microemboli or vascular spasm. The present study shows that endovascular intracarotid infusion of cold normal saline at a flow-rate of 33 mL/min led to a rapid decrease in JVBT and an ipsilateral drop of MCA blood FV. To the best of our knowledge, this is the first report that describes the hemodynamic effects, feasibility, and safety of selective brain cooling in humans by means of endovascular intracarotid infusion of cold saline. The most commonly described goal of hypothermia as a neuroprotective measure is to reduce metabolic rate. It is known that the physiologic parameters of metabolic rate and CBF are coupled to temperature over a wide range of temperatures, uncoupling only at <20°C.32,33 Studies in animals and humans investigating systemic hypothermia and selective brain cooling have confirmed the validity of the concept of this physiologic coupling.32–36 In our study, oxygen extraction remained unchanged after selective brain cooling. This may be because cooling duration in our pilot study was only 10 minutes; feasibility and safety were the main goals of this study. The linkage between temperature and metabolism might be demonstrated with longer cooling durations and deeper brain cooling. Eventual demonstration of the temperature-dependent change in brain metabolism would support the hypothesis that the local cold infusion is acting as a neuroprotective agent by inducing a hypometabolic state. JVBT was used as our measure of brain temperature because the use of invasive parenchymal temperature probes cannot be justified in elective or acute ischemic stroke patients. However, considering the phantom model results, the rapidly achieved temperature equilibrium between blood in the capillary network and brain matter (heat conduction), and potentially mixed composition of the JV blood from contributions of both hemispheres (“contamination” with warm blood), it appears likely that the actual brain temperature is lower than the measured JV blood temperature, which in itself was significantly lower than the body temperature measured in our cohort. 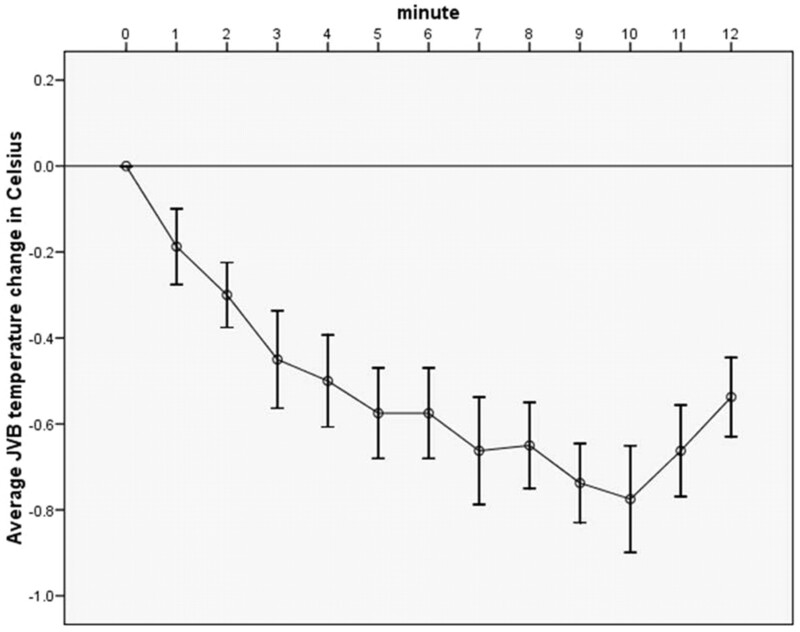 According to the phantom model results the perfusate temperature was ∼35.2°C when saline input temperature was ∼7°C (Fig 1), as it was in our clinical study, part 2. Considering the experimental baseline temperature was 38°C, the difference would be 2.8°C. Thus, we assume that the brain temperature (including the possibility of contributions from the contralateral hemisphere) may have decreased by between 0.8°C and 2.8°C. Apart from theoretic models that support the feasibility of endovascular brain cooling,25–27 Kleiber's rule, which describes the relationship between the BMR of animals with their body weight as a function of BMR = 3.52 × weight0.74, may give further insights.37 Applied to an 8-kg rhesus monkey or a 10-kg dog, the BMRs relative to a 70-kg human body are 1.7 and 1.6, respectively (Table 1). When adjusted for these factors, the cold infusion (4–13°C) rates used in the animal experiments projected to human scales would range between ∼20 and 44 mL/min, which would lead to a significant brain temperature decrease.22–24 Furthermore, the exponential shape of our JVB temperature curve can be found in several animal experiments where actual brain temperatures were measured,18,22,24 giving insights into speed and degree of cooling when infusion parameters are changed, for instance to colder saline temperatures than were used in the present pilot study. MR imaging-based thermometry is a promising alternative38 for noninvasive on-line monitoring of brain temperature during clinical investigations such as ours, which may become a reality with further technologic advancement, also allowing endovascular procedures in an MR environment. The initial (baseline) difference in systolic velocities we found between the hemispheres before cold infusion might be explained by hemodilution created by the infusion of nonhematologic material, which has been shown to increase CBF.39–41 With regard to changes in flow after cold infusion, our study setup did not allow the calculation of CBF. TCD FVs were measured as a surrogate. A lack of knowledge about whether there were any changes in MCA diameter precluded quantitative CBF assessment. However, FV data are still useful with respect to hypothesis generation. While the constrictive effect of cold on peripheral vessels is widely accepted (eg, vasculature of the skin during cold exposure), there is controversy with regard to the effect of cold on the diameter of larger vessels supplying the brain. Studies on ex vivo specimens from ICAs of animals and MCAs from human autopsies revealed vascular relaxation during cold exposure.42,43 Relaxation of the MCA during TCD insonation would result in a decrease in MCA FV, which we observed in this study. A concurrent increase in peripheral vascular resistance (increase in PI) suggests that there was constriction of arterioles and precapillaries. Our findings led to 2 possible physiologic scenarios: first, that peripheral vasoconstriction occurred as an autoregulatory response to reduced metabolism, or second, that our observed changes occurred as a direct effect of cold on the vasculature.44–46 It is also possible that both mechanisms are involved. Longer cooling times with additional data on oxygen extraction may help sort out the underlying mechanism. One limitation on the technique could be the volume of normal saline and the hemodilution effect, though it appears from clinical experience in cardiac arrest and acute ischemic stroke that the body is able to cope with volume loads of >2000 mL/h.47–49 Finally, we observed transient shivering in 3 patients. It remains unclear whether this was caused by brain cooling or the slight reduction in body temperature. Although overall discomfort during short-term selective cooling was mild (transient systemic shivering in 2 of 11 patients) and no pain was reported, it is possible that during longer term selective cooling greater discomfort may occur. A warming blanket may then not suffice and pharmacologic means may be necessary to counteract the shivering. The results of this clinical pilot study suggest that selective endovascular brain cooling by means of intra-arterial infusion of cold saline is feasible and safe in the setting of a neuroendovascular suite. Endovascular brain cooling may constitute a rapid, selective, and safe method for hypothermic neuroprotection in patients with acute ischemic stroke, especially in conjunction with local recanalization therapy, or in patients undergoing neuroendovascular procedures, where thromboembolic events are major threats. The underlying neuroprotective mechanism (temperature-dependent effect on brain metabolism and CBF) requires confirmation in a larger study with more direct measurements of CBF and cerebral metabolism. Further clinical studies are necessary (and underway) to assess the safety and feasibility of longer term endovascular brain cooling and its physiologic effects in acute ischemic stroke patients. We are grateful for the technical support by the Horace W. Goldsmith Doppler Laboratory and the Interventional Neuroradiology Angiography team. This study was supported by the New York State Office of Science, Technology, and Academic Research (NYSTAR) and the Dana Foundation (Clinical Neuroscience Research Grant). Previously presented in part at: 16th European Stroke Conference, Glasgow, Scotland, May 29–June 1, 2007. Indicates article with supplemental on-line table. Accepted after revision October 13, 2009. Letter by Mattingly et al Regarding Article, "Endovascular Hypothermia in Acute Ischemic Stroke: Pilot Study of Selective Intra-Arterial Cold Saline Infusion"
Response by Chen et al to Letter Regarding Article, "Endovascular Hypothermia in Acute Ischemic Stroke: A Pilot Study of Selective Intra-Arterial Cold Saline Infusion"
Therapeutic Hypothermia for Brain Ischemia: Where Have We Come and Where Do We Go?